Filipinos like to nibble while they drink, hence the Pulutan (dishes for drinking session) is popular among the locals. The men usually cook their own homemade Pulutan to pair with a couple of ice cold beers. Grilla had this in mind when it pioneered in its big hit creations such as "Buckets of Beer" and the "Grilla Feast" (chicken-pork barbeques served in bilaos) meant to be shared among groups and families. Grilla had its humble beginnings in Antipolo City in the year 1998 as an eatery. 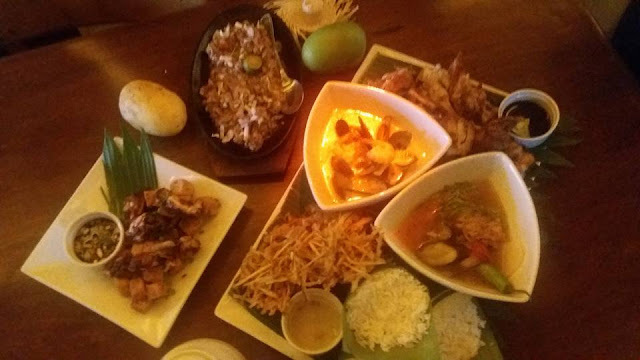 In 2013, Grilla Bar and Grill was renamed to Grilla Filipino Cuisine as it switched focus to expand its culinary offerings, making it more family-friendly. As it turns 19 this year, Grilla Filipino Cuisine now carries the all-time Filipino favorites plus several authentic regional specialties. 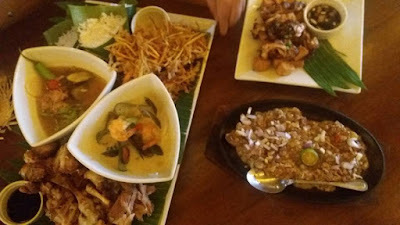 It give you more reasons to appreciate the Filipino creativity when it comes to food by added more Filipino dishes to their menu. Tokwa't Manok is Grilla's healthier version of the famed Tokwa't Baboy. In this version, the tofu is fried to a golden brown. The tofu cubes appear juicy inside and crispy outside. It is topped with grilled chicken slices and red onions on top. The dish is seasoned with spiced sweet-soy-vinegar sauce served in the side. 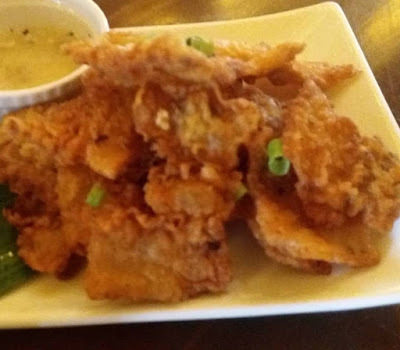 Crispy Chicharon Bacon is Grilla's Pinoy version of bacon. 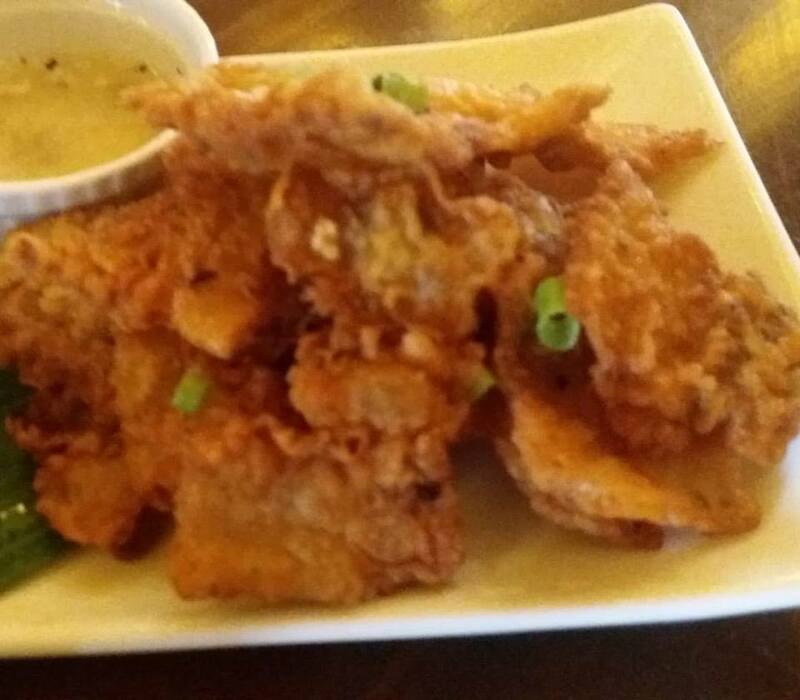 The coated pork strips is deep golden-brown and crispy! I enjoyed this appetizer, It was a perfect perk up for more Grilla food. Sisig Sampler comes in a a large sizzling plate. Grilla's Pork Sisig, Chicken Sisig and Bangus Sisig are served while it’s still hot. 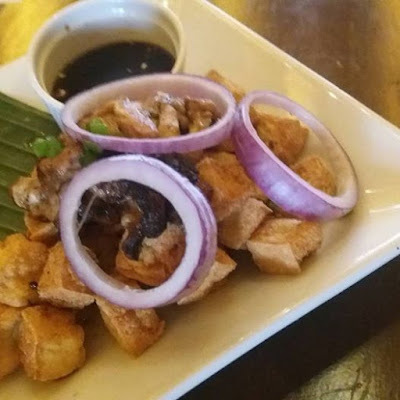 You may also opt for Squid Sisig and Tofu-Sigarilyas Sisig. And for me, Sisig is best paired with Crispy Fish Trio and fresh Steamed Rice. 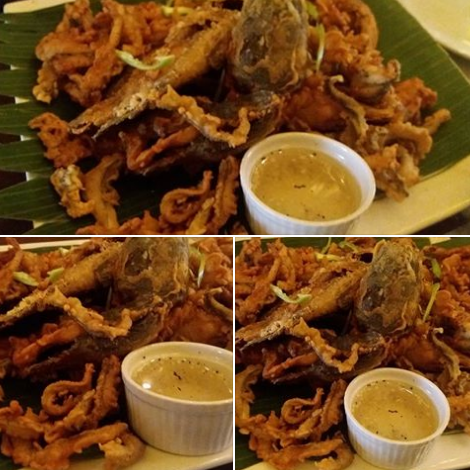 Crispy Fish Trio refers to fried fillets of tilapia, hito and bangus served with vinegar dip. Thinly-sliced fish fillets were dipped in batter and fried until golden brown. 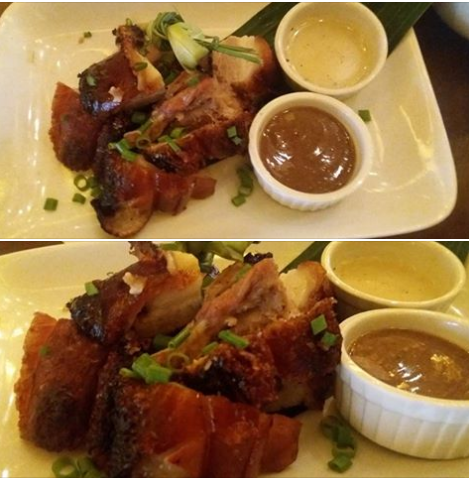 Lechong Liempo ala Cebu was flavorful! The Visayan secret to this great pork dish truly manifests with Grilla’s version of Cebu lechon liempo. The pork skin comes out crunchy while the tender meat remains succulent. You can eat it even without the sauce! 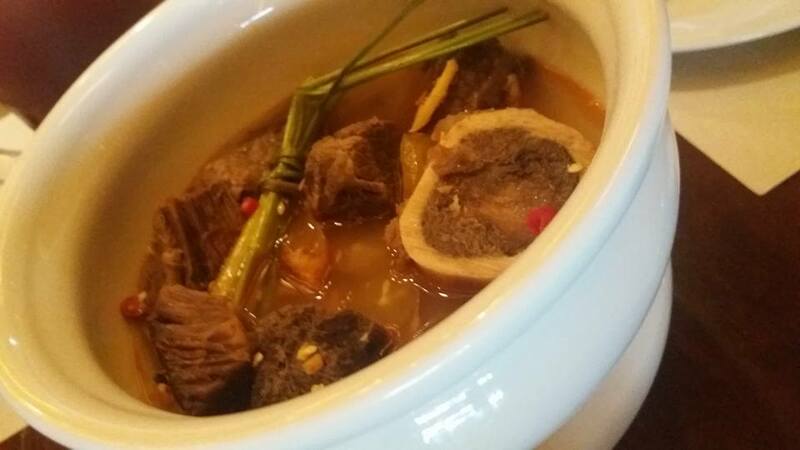 This soup dish from Angeles, Pampanga is the perfect companion to any meal. It doesn’t rival the asim-kilig characteristic of sinigang, but the almost-tangy flavour complements well with the grilled chicken and vegetables. What warms the tummy also warms the heart. Beef Kansi is similar to bulalo except that the soup is spicy and sour. 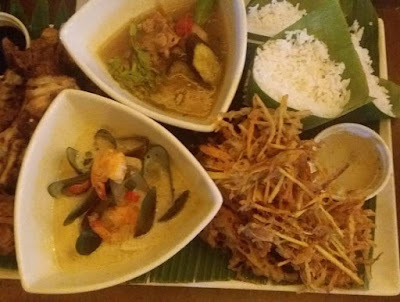 This popular Bacolod dish uses kamias to give it a sour taste. Pista sa Nayon consists of Crispy Pata, Sinampalukang Inihaw na Manok, Seafood Gising-Gising, Fried Okoy and Steamed Rice. Crispy Pata's tender meat had the right mix of saltiness. It was my favorite! Inihaw na Manok sa Sinampalukan is Grilla Filipino Cuisine's take on Pampanga's famed the Sinampalukan dish, The roasted chicken pieces were cooked in a sinigang broth. Grill-A-Palayok was a localized hotpot. It had prawns, beef, clams, mussels, fish, lemon grass and bacon strips, The palayok had rocks to keep the infused flavors and broth warm throughout tyhe feast! For desserts. 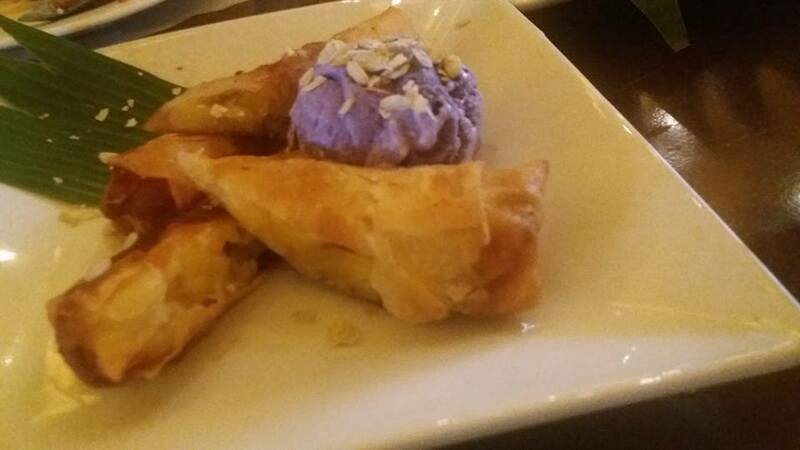 we had Halo Halo Spring Rolls and the Grilla Grilla Dessert Sampler. Halo Halo Spring Rolls had the usual ingredients (mongo beans, sweetened saba, and kamote) rolled in a lumpia wrapper. It was deep fried, and then topped with ube ice cream. The hot and cold combination was awesome! Head on to Grilla Filipino Cuisine for a great dining experience! It will not disappoint. WIll definitely check this place once na nagawi kami sa MOA. Sarap talaga pag noyping noypi ang menu. There's so much delicious dishes here. It's nice that they have their own take on Filipino delicacies.